Office Panels can only be shipped in multiples of 2! A stylish and innovative way to add light to nearly any room via the ceiling panels, these bright and sleek High Efficiency Backlit Panels are ideal for use in commercial grid ceiling applications. A unique take on the classic style of backlit panel, this unit features a borderless design creating a smooth a modern look on your ceiling. Each panel has been durably crafted from a strong and lightweight extruded aluminum housing with an integrated LED light held securely within it. 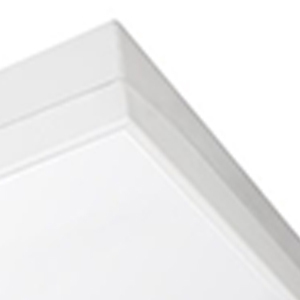 Complete with an opal lens that provides uniform light distribution to any room it’s installed in, this panel is dimmable between 0 and 10V (requires low voltage wires and low voltage dimmer) and takes less than one second to light up fully once turned on. These impressively efficient backlit panels come in several different sizes and more than one color temperature, so you can truly fit these fixtures into any space. 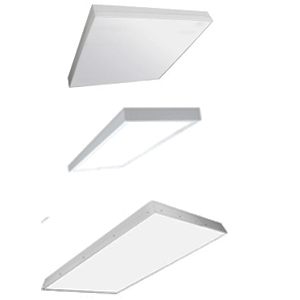 Ideally suited for offices, classrooms, hallways, basements or anywhere with a drop ceiling. The body of the unit was painted after application to allow for smooth edges and safe installation, as well as inhibiting future corrosion. LED DRUM FLUSH MOUNT FIXTURE 50,000 HOUR OPERATION HIGH LUMEN ENERGY EFFICIENT - CHOOSE 11" OR 14"